Get back your quality of life and live life to its fullest. 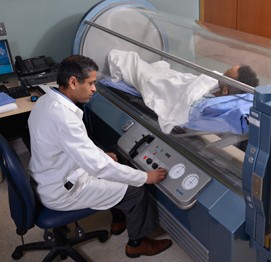 TBHC's Wound Care and Hyperbaric Center, located on the tenth floor of The Brooklyn Hospital Center, specializes in a comprehensive approach to treating persistent, slow-healing wounds. If you or a loved one has a wound or sore that has not healed in 30 days, you may have what is referred to as a "chronic, non-healing" wound. The Center applies proven wound care practices and advanced clinical approaches, including dressings, antibiotics, and hyperbaric oxygen (HBO) therapy. Our four hyperbaric chambers provide increased air pressure to help your blood carry more oxygen to organs and connective tissue to promote wound healing. “HBO” therapy is a medical treatment that enhances the body’s natural healing powers and strengthens the immune system. Delivered by trained Wound Care specialists, HBO is a highly effective treatment option for most chronic wounds. Using a team of multidisciplinary specialists and state-of-the-art wound care techniques, the Center achieves excellent healing rates and fast healing times. That means you can quickly get back to living your life the way you want.